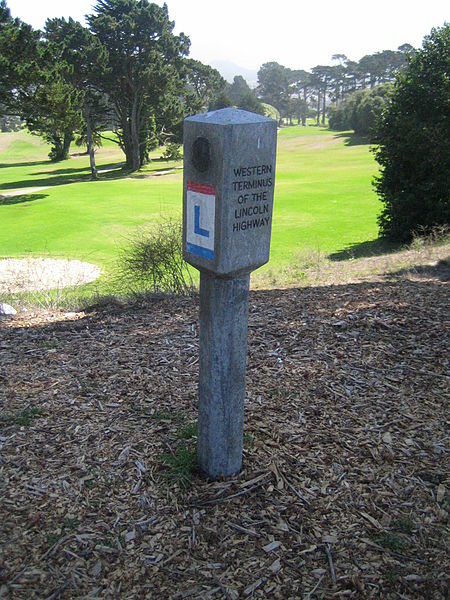 In 1913, the Lincoln Highway Association developed its cross-country route. Why not think big, and put the eastern terminus at the center of East Coast civilization? 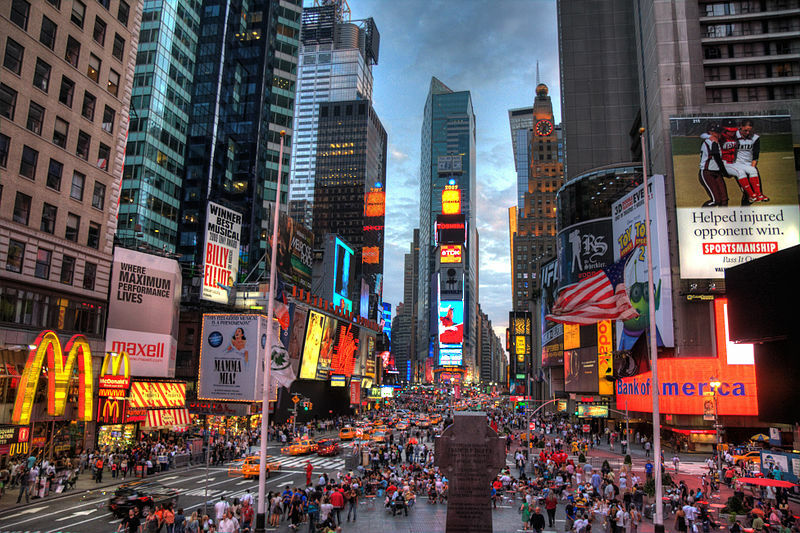 The association declared that the southeast corner of Times Square, at 42nd Street and Broadway, would be the starting point of the highway. Even back then, Times Square was a busy, boisterous place. First named for the New York Times in 1904, when the newspaper moved operations to a skyscraper in the former Longacre Square, it boasted an electrified advertisement that same year and soon had enough electric signs for the section along Broadway to be called the “Great White Way.” And the Hotel Astor was built nearby, occupying an entire city block. 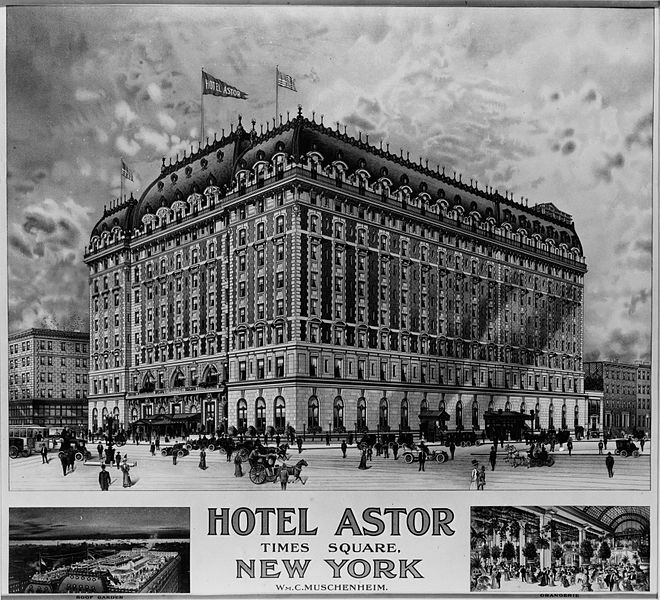 Completed in two phases, in 1905 and 1910, the Astor was the grandest of hotels. 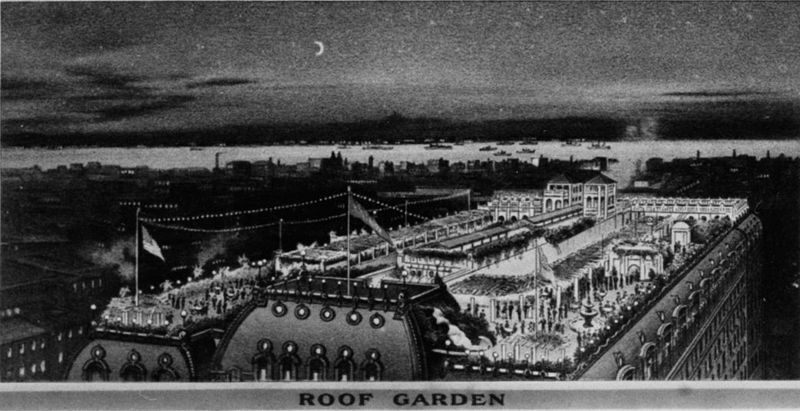 It featured two ballrooms and a “Pompeiian” billiard room, grill rooms and themed restaurants, a “Flemish” smoking room, indoor gardens, and a rooftop garden. The hotel operated until 1967 and was demolished the next year. During the first decades of the Lincoln Highway, Times Square was associated with the high life in the “Tenderloin,” where one might encounter celebrities such as Charlie Chaplin, Fred Astaire, and Irving Berlin. But crime became a problem, and in the years after the Great Depression, the neighborhood went downhill, giving way to the era of adult theaters and go-go bars. It finally experienced a renaissance starting in the early 1990s. For the first 15 years of the Lincoln Highway’s existence, automobiles traveled from Times Square across the Hudson via the Weehawken Ferry, which landed in Union City, New Jersey. 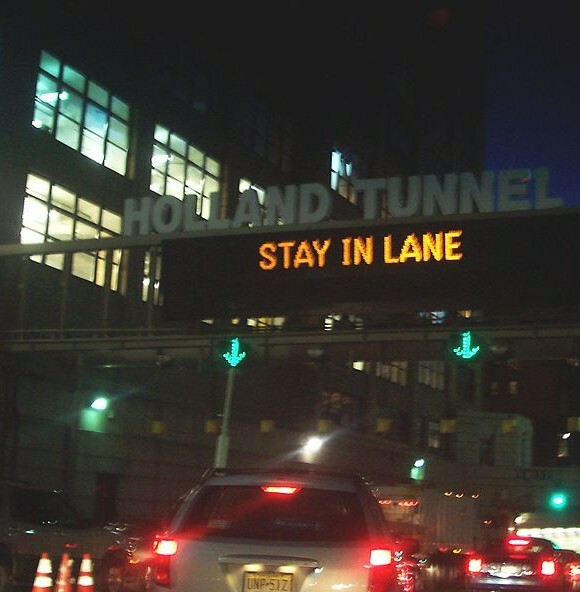 After the Holland Tunnel was opened in 1927, the highway was rerouted to go through it. Confusingly, the Lincoln Tunnel was never the route of the Lincoln Highway—it was named to give equal prominence to Abraham Lincoln after the construction of the George Washington Bridge, and did not open until 1937. Within the first decade of the 20th century, ferries were carrying up to 30 million vehicles each year across the Hudson. Clearly tunnels and bridges were needed. Although bridges seemed a less costly solution, there was a slight problem for a crossing from midtown Manhattan: the bridge would need 200′ clearance for ships to travel under it to Hudson River ports. That would require a very long approach. Although rail tunnels already existed under the river, auto tunnels posed new challenges of vehicle exhaust and a wider required diameter. Engineer Clifford Holland worked to design an exhaust system. He came up with an innovative plan that simultaneously drew in clean air and expelled dirty air, using a total of 84 fans. The tunnel’s air can be completely cleared in 90 seconds. Construction of the tunnel started in 1920. Workers, called “sandhogs,” often suffered from the “bends,” and 13 died in the course of the project. Teams working from the two shores finally met, and the tunnel was dedicated November 12, 1927. President Coolidge formally “opened” the tunnel with the same key that had dedicated the opening of the Panama Canal in 1915 (one wonders what ceremony it was exactly that he performed with the key). It takes quite a stretch of the imagination today to picture the first cross-country travelers on the Lincoln Highway, leaving Times Square, catching the ferry, and embarking on a journey of thousands of miles that would take them into the wilds of the west. This started out as an open-ended exploration up Alum Cave Creek. Dave and I wanted to take a look up the creek to see if we could identify any good spots to take off toward a slide on Anakeesta Ridge. 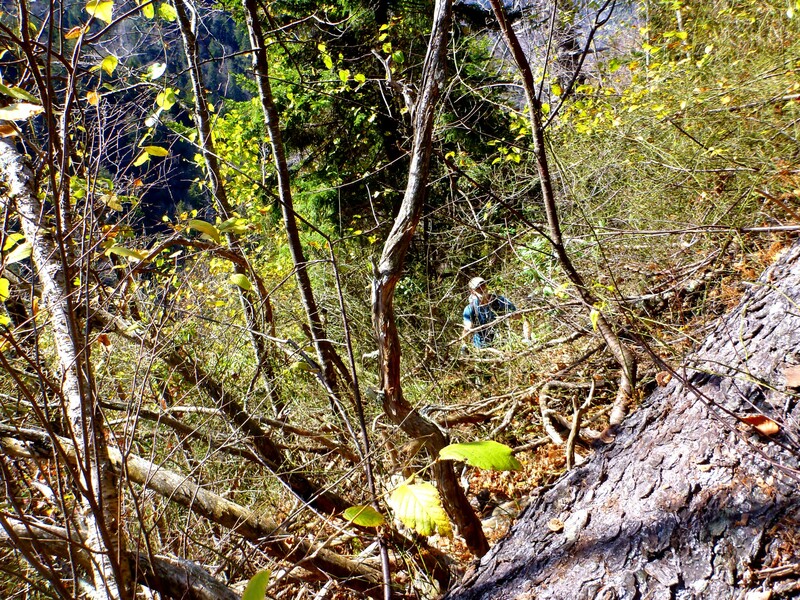 On an infamous hike last month, we’d attempted to reach the slide, only to find that we weren’t even on the right creek. 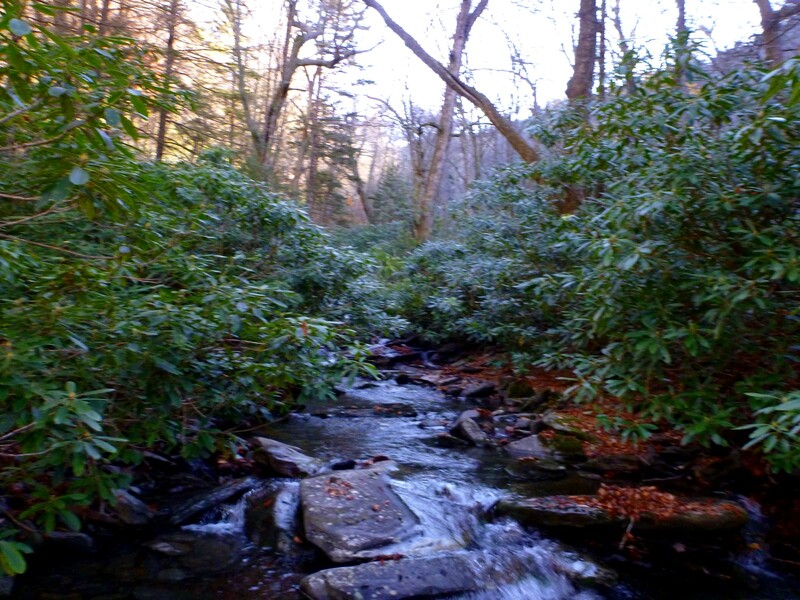 The challenge of ACC is that it is truly hemmed in with rhodo along both of its banks. 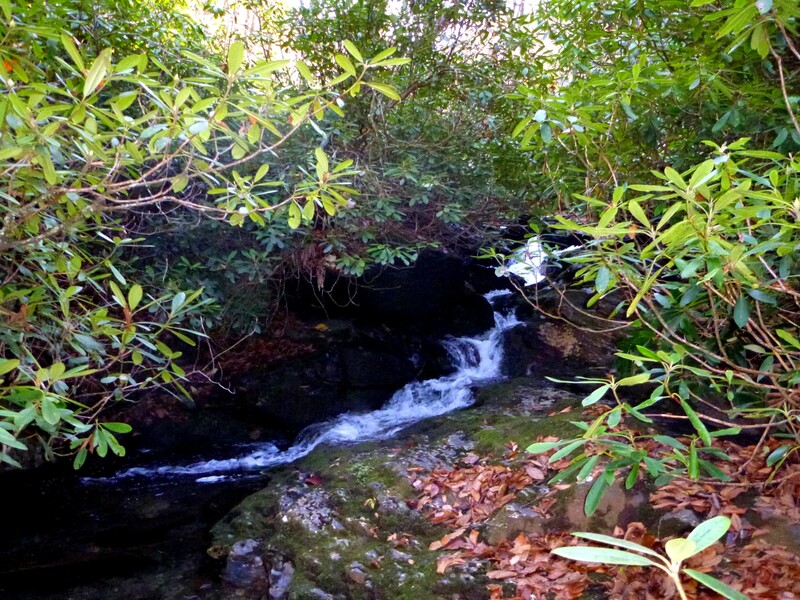 The stream does have some pretty pools and cascades. 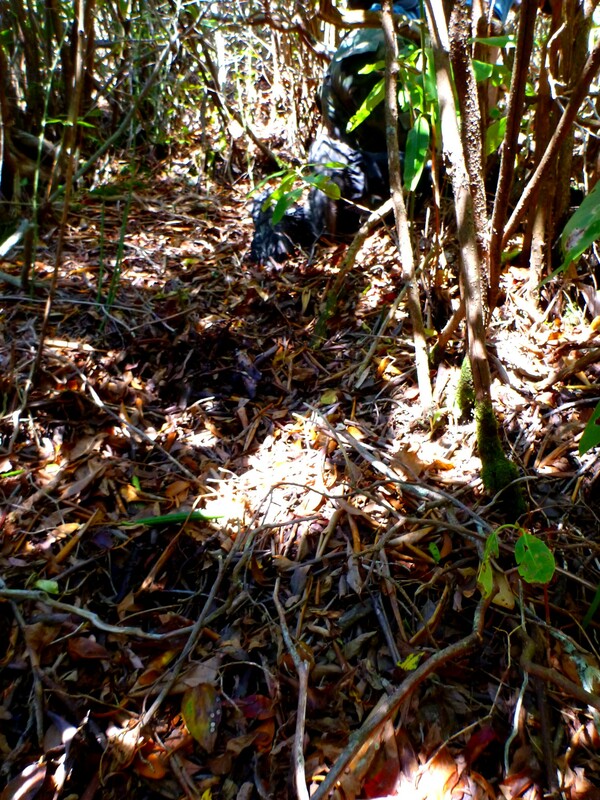 It became clear that we would not find easy access to Anakeesta Ridge along the stretch where we’d hoped to miraculously discover a secret opening in the underbrush. 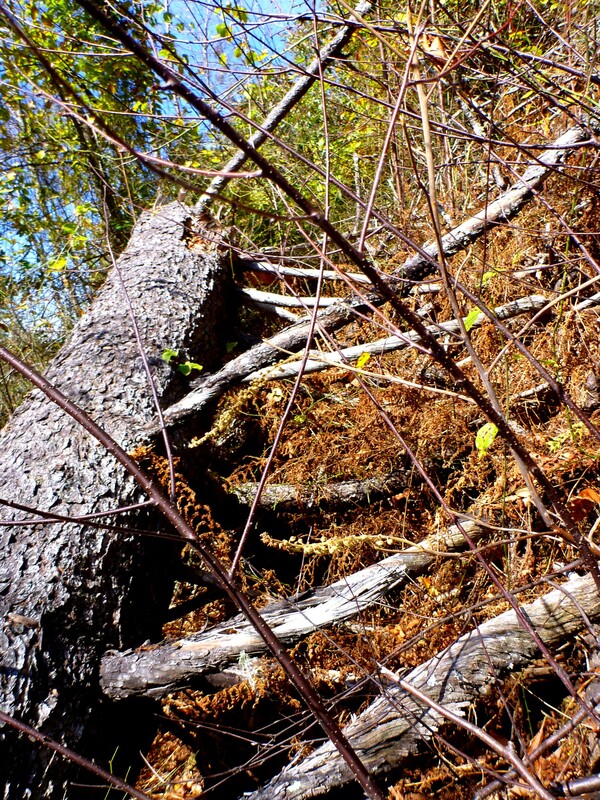 When we got to around the 4600′ elevation mark, we saw open woods to our left and decided to abandon Plan A and give Plan B a try—why not, indeed? 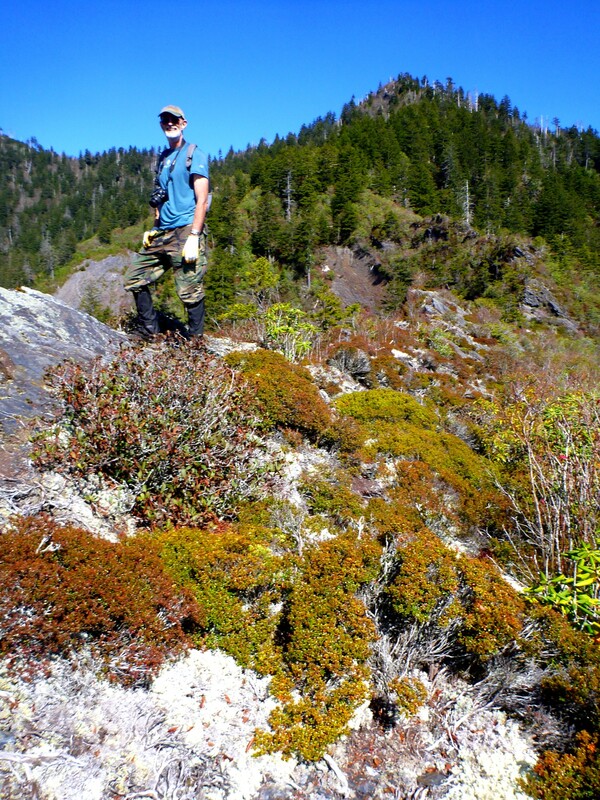 So we ended up climbing No-Name Ridge—a place I’d been thinking about going anyway. 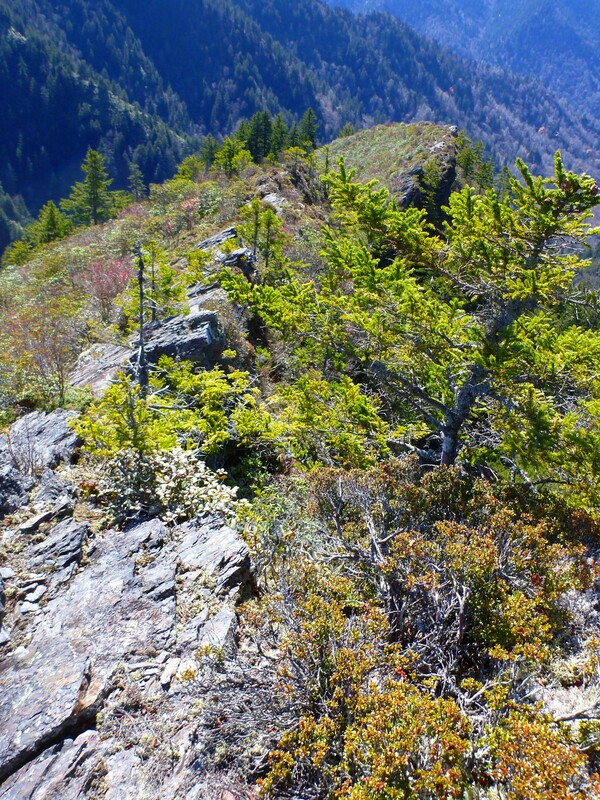 The openness vanished in a couple hundred vertical feet. We ran into a ferocious mix of blowdown and brier. 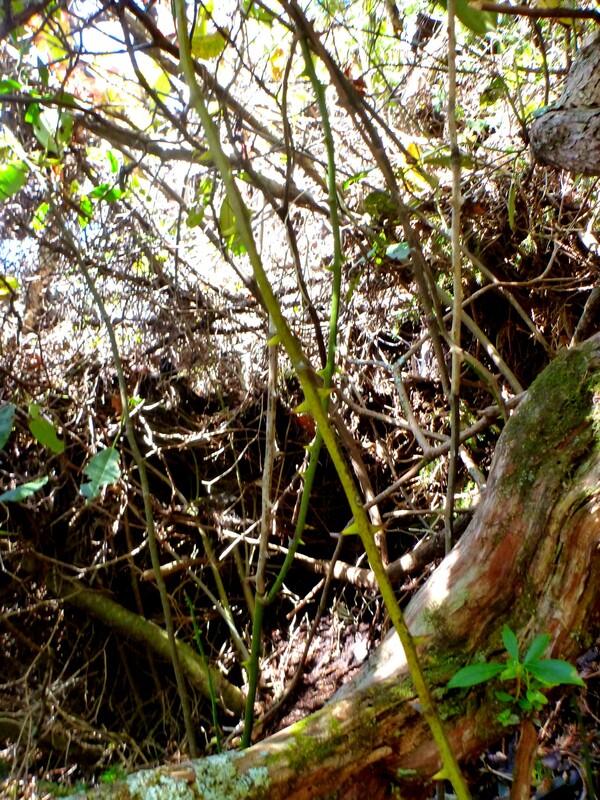 We’d escape from the briers into the blowdown, then escape from the blowdown into the briers. The briers in that whole Styx/ACC area are a special, extra-angry variety. 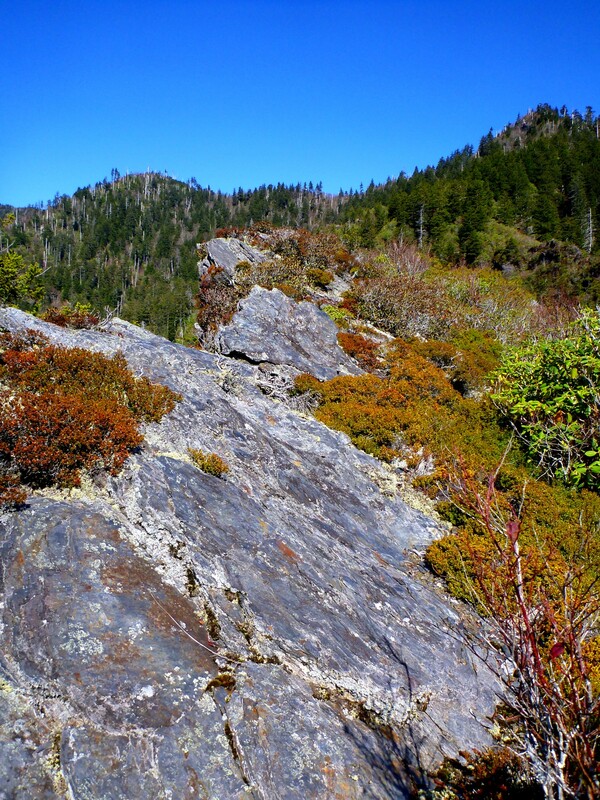 As we approached the ridgecrest, we crawled through a bearway. Dave took his pack off and pushed it along in front of him. We arrived on top to discover that this is a magical place. The rock slabs reminded me of the particular kind of Anakeesta that you find on the Chimneys, sufficiently eroded to be free of the loose stuff you find on slides more recent in geological time. 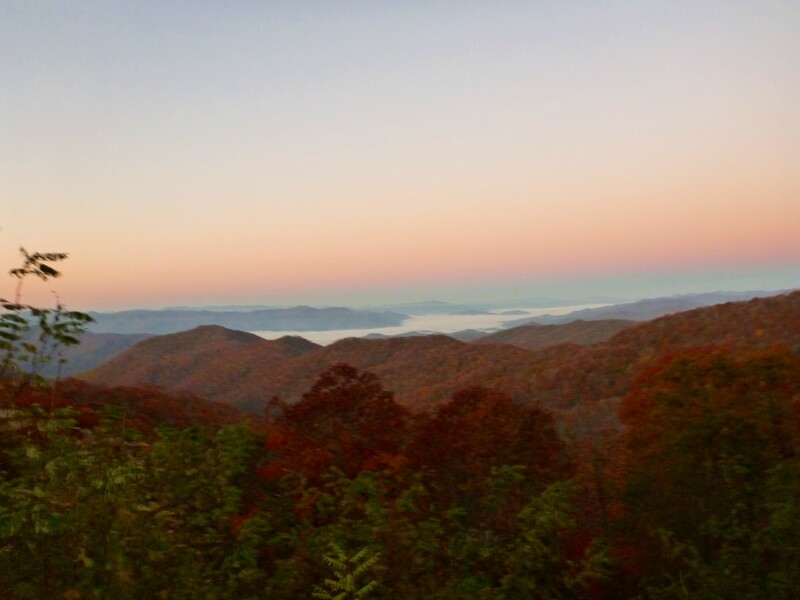 We picked up an obvious manway along the knife-edge ridge and climbed to the 5916′ point where it meets the Boulevard trail, then went out via Newfound Gap. At times on the ridge we had to dodge some obstacles, but the going wasn’t bad. We ran into a few patches of snow. A friend has told me that he found a good way going up a slide to No-Name. I think there must be a better route starting a little further up ACC. But the advantage of our route was that we had a slightly longer stretch along the open ridgecrest. I would also like to try going up from the stream junction at 4300′. Note added 9/27/12: Since I wrote this series, the Lincoln Highway Association has added an interactive map showing the exact route of the Highway in its different stages. You can find it here. In August and September I wrote a series of posts about a wonderful road trip I took that involved visiting state high points and Civil War battlefields. In the final installment I promised to write about the history of road trips on US highways. It didn’t take me long to realize that the topic was far too vast. I decided instead to narrow the subject to the history of a single highway, the Lincoln Highway. I’d traveled a very small section of this transcontinental highway on my trip, the portion between Gettysburg and McConnellsburg, PA, going over the Tuscarora Summit. One might argue, however, that because I traveled the highway in Gettysburg, I went to the heart of the road named for Abraham Lincoln. The highway was the first to span the United States, running from Times Square in New York to Lincoln Park in San Francisco. 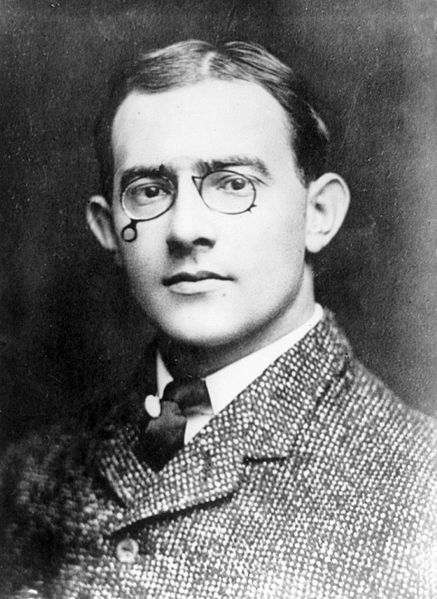 A man named Carl Fisher was the force behind the idea. Gung-ho about developing the automobile industry, he was one of the major investors in the Indianapolis Speedway and the founder of Prest-O-Lite, a company manufacturing carbide-gas headlights. He believed that if people were enabled to drive across the country—or even a hundred miles or so between towns—the use of automobiles would get a great boost. 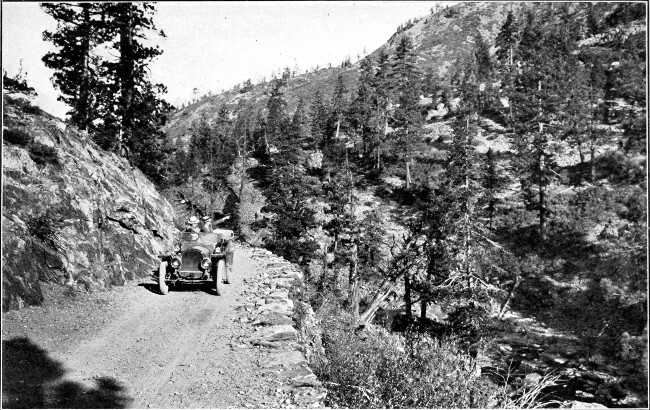 In 1912 he gathered together a group of automobile entrepreneurs and beguiled them with the concept of a “Coast-to-Coast Rock Highway.” At that time, a road was considered “improved” if it even consisted of graded dirt as opposed to rough tracks where automobiles bogged down in dust or in mud. Hardened surfaces of gravel or brick were limited to short segments near towns, and asphalt surfaces did not yet exist. People did not think of automobiles as the means to travel long distances: that’s what railroads were for. The president of the Packard Motor Company, Henry Joy, was the individual who thought of naming the highway for Lincoln. At the time, Congress was deliberating over a proposal to build a memorial to Lincoln in Washington, DC. Joy preferred the idea of a transcontinental highway as a memorial. In the end, both would come to be, and a rival route between Gettysburg and Washington would be defeated, making the Lincoln name available for the larger project. The Lincoln Highway Association was founded in 1913 for the purpose of raising funds and determining the route. A “Trail-Blazer” tour set out in July of that year. The convoy of 17 cars and two trucks wallowed through midwestern mud, then sand drifts in Utah and Nevada, as well as enduring many mechanical problems, and finally arrived in San Francisco for a jubilant parade. Everywhere the convoy went, it was hailed enthusiastically by residents of towns that wanted the highway to come their way. In the end, many were disappointed—particularly in Kansas and Colorado, which were bypassed in the final route decision even though the Trail-Blazer tour had come their way. Under heavy pressure from the Colorado governor, the LHA agreed to a major detour that would take the highway through Denver. Eventually, though, the Colorado loop was eliminated. In many sections the route made use of old roads, including a 17th-century road in New Jersey laid out by Dutch colonists; the Chambersburg turnpike used by Lee’s Army of Northern Virginia to reach Gettysburg; portions of the Mormon Trail; routes used by the Pony Express; and the Donner Pass crossing of the Sierras. Although some in the automobile industry thought the federal government should pay for the whole thing (Henry Ford was the chief proponent of this point of view), the highway was initially financed by private contributions and state government funds. In 1916, the federal government agreed to provide matching funds to states for interstate construction. It wasn’t until 1925 that a federal-state Joint Board on Interstate Highways was created and a numbering system for highways developed. 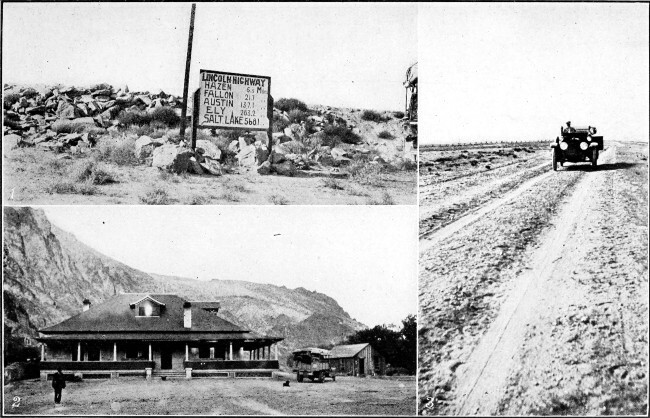 Although the LHA would have preferred having a single number to designate the highway over its entire transcontinental length, practical considerations about adjoining highways led to the use of several numbers. At present, the highway comprises several different numbers, mainly US 1 in New Jersey; US 30 most of the way between Philadelphia and Granger, WY; US 50 across Nevada and on a southern route across the Sierras; and US 40 from Sacramento to Berkeley, CA. Many other route numbers for short segments are mixed in. 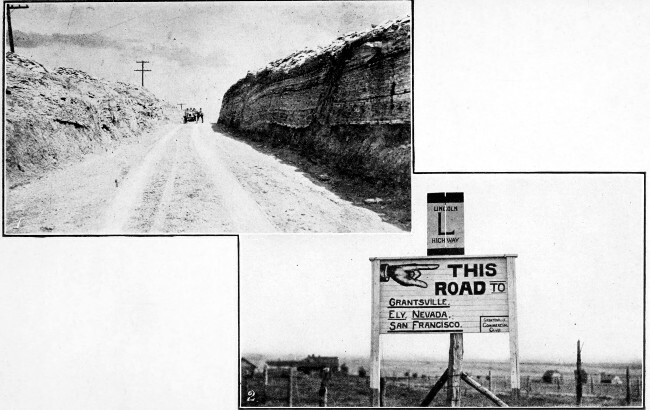 Lincoln Highway in Wyoming, typical sign in 1914. This has been a very cursory treatment of a big subject. For further details, you can visit the Wikipedia site and the excellent site of the present-day Lincoln Highway Association. In my next installments, I will discuss the highway as it crosses individual states. Western terminus of the Lincoln Highway. Photo by David Monack.